Free fun in Austin has no limits! Below are a couple of free fun activities that we recommend in the Austin area. Have fun! Concerts in the Park happen every weekend at the Hartman Concert Park in front of the Long Center City Terrace. The Austin ensemble puts on a free concert with shows ranging from classic to jazz! If you like history, then the Texas State Capitol is the place for you! The architecture of our Capitol building resembles the look of the U.S. Capitol building and the grounds surrounding the capitol are absolutely gorgeous — making for the perfect location to walk your dog or have a picnic in the park. Tours of the Capitol building are only free for groups of 10 or more with a reservation. Spray paint art, also known as graffiti, is a great way to express yourself! However, it isn’t always legal — but thats not true of the Hope Outdoor Gallery. The Gallery is located on 11th Street and Baylor Street and boasts a tremendous view of downtown. The art here is always changing - so there is always something new for everyone to see! Bull Creek Greenbelt is a great location to explore the outdoors and escape the hustle and bustle of the city. Take a drive, enjoy the creek, and if you’re really up for it, there is a 3.5-mile hiking trail that’s amazing! Live music and Austin, Texas, basically go hand-in-hand, and it doesn’t get more Austin than the Blues on the Green concerts in Zilker Park. This concert series has been hosted every summer and is FREE to the public! 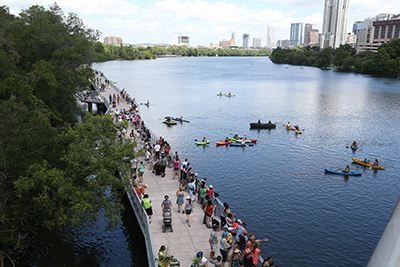 Lady Bird Lake runs directly through Austin, TX, and is an outdoor haven for Austin residents. If you’re an outdoor enthusiast then this Austin location is the place for you! Austinites love to use the 10-mile trail around the lake to get their daily exercise. Also, in the summer months, you can rent out kayaks, canoes, or paddle boards, and enjoy the outdoors on Lady Bird Lake. Look around for a local farmers market! This gives you the perfect opportunity to see local Austin fares and produce. Just because you go doesn’t mean you need to purchase anything, you can just go to people watch and see what local Austin farmers and small businesses have to offer! South Congress, known as SoCo to Austin locals, is the very definition of Keep Austin Weird. This Stretch of Austin, just south of downtown, is home to many weird shops, fun eateries, and great views of the Texas Capitol building! This is a stop you don’t want to miss. Have you ever noticed that the mosquito level in Austin is low? Well, that’s because we have bats! Every night thousands of bats flock from the Congress Avenue Bridge to search for food (mosquitos). You have to see this at least once! Just beware that it may stink! Austin is no stranger to weird art, and these wall murals all over the city that perfectly! The most photographed mural, “I love you so much,” is located just near South Congress. So, grab a friend and pose for pictures at this wall mural and explore the city! Have fun!